It was overcast when we arrived in Munich at 8 AM. There was some hassle waiting for the rent-a-car people to pick us up. Looking around the airport I noticed the fine bakery (how do these people stay thin with all these carbs?!) and how professional and classy the young people looked. Finally, with much ado, we got a rental car – a Mercedes of some kind – and we ventured onto the roads. John was concerned that I had refused the insurance, so I called Visa to make sure that their coverage was good internationally. I love the subtle coloring of things and notice the trees just beginning to bud. It is somewhat cold (40 degrees F.), but feels very refreshing. The Munich airport is about 25 km north of Munich, surrounded by fields and little villages. 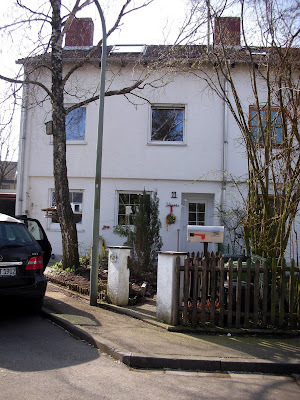 We made our way to Hartwig and Margret’s home in Parsdorf without too much problem. I had printed maps from Mapquest. Parsdorf is a village of about 1000 people, 10 miles or so East of Munich. It seems to be very typical of the many villages of Germany that dot the landscape – not a suburb, but a village that is separated from the other villages by fields and forests. We have not visited Hartwig and Margret in Germany since 1999, so they are very glad to see us. Hartwig and I worked together in the early 1980’s. He was an engineer for a German company that was producing silicon chips in the USA. I was an IC (integrated circuit) layout designer (a drafter of sorts in the early days of CAD – computer aided design). Our families became friends and we have visited back and forth with each other ever since. After a typical Bavarian lunch - Wiesswurst (white sausage) and other assorted hams and cheeses, beer - we decide to take a nap. Hartwig and Margret give us the 3rd floor of their home. John and I still maintain that this is one of our favorite places to sleep. The sloping roof and European bed with flannel comforter and pillows make it delightfully cozy and comfortable. About 4pm we get up for yet another Bavarian snack, and then take a walk around the village. Spring is in the air. Everywhere trees are budding and every house has a little tree decorated with colored eggs. The Maypole is in the center of Parsdorf, along with some restaurants and biergartens. All closed now. 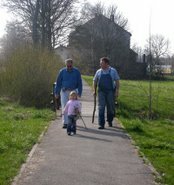 We walk down to the GrundSchule (elementary school), which all of the children of Parsdorf attend. There are 2 large soccer fields. Soccer is very big here and all of the children are encouraged to participate so that they can learn team play. At around 10 years of age, they must go to a different town for school. The town church, St. Nicholas, dates from 1483. The present priest is Polish, with a name that no one can pronounce (or so Hartwig says). Though it is a Catholic Church, the 4th week of every month the Protestants of the village use the church for their service. 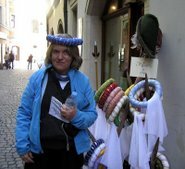 Hartwig was raised Protestant and Margret a Catholic, so they attend the Church every week, whether Protestant or Catholic. Margret says that most of the villagers do the same. Their son, Axel, was married in the Church. Surrounding the village are fields that are almost always planted in some kind of food – potatoes, wheat, etc. We walk over to the large Segmoller Home Store that is on the main highway. Since the main highway was built, all of the smaller roads of the village were converted to bike paths and pedestrian walkways. We walk down the Salz Strasse (Old Salt Road) which is the original road that was used to bring salt (”white gold”) from Austria during the Middle Ages. Salt was essential to preserving food and enabling it to be traded. This road, which goes through Parsdorf, was a very important trade route between Salzburg and Augsburg (the other side of Munich). That evening we went to a local restaurant – Gasthof Zur alten Post. This restaurant dates from the 1400’s and was a Coach House, serving the coaches and horses that traveled the Old Salt Road. The food is excellent. ( See photos from the Parsdorf set here.) We end with an Austrian dessert – kaiserschmarrn - a kind of burnt sugar strudel, omelet-like with raisins, nuts and apples. According to the legend, when the emperor’s cook was making an omelet he screwed up, so he added raisins, nuts and apples. The emperor (Kaiser) was so impressed that the dish was named for him. Hartwig says that this is not a real restaurant, just an inn, but I don’t know that we will get better Bavarian food anywhere. After dinner Hartwig, John and Eric had schnaps. I love to hear Margret tell about their travels to warm places so that she can snorkel. I like to swim as well and can relate to her passion. Of late her favorite place is Africa. Most recently they were in South West Egypt (the Sinai Peninsula) where she snorkeled in the Red Sea. Next they will go to Namibia. Margret says that Africa is wonderful because of the love of the people whose lives are poor and desperate, yet they know the miracle of the moment and do not hurry. In our attic room there are posters showing the many fish of the Maldive Islands.